ATLANTA (AP) — Pete Alonso has made a powerful splash during his first two weeks in the majors. The rookie rocketed his latest homer into a terrace fountain far beyond the center field fence, and the New York Mets beat the Atlanta Braves 6-3 on Thursday night. Amed Rosario homered and drove in a career-high four runs, and Steven Matz pitched six effective innings to snap the longest streak of no-decisions in Mets history. Alonso lined a two-run shot in the seventh off reliever Jonny Venters, a 454-foot laser with a 118 mph exit velocity that splashed into the tank beyond straightaway center and wound up floating softly in the water. The only players with harder-hit home runs recorded by Statcast are Giancarlo Stanton, Aaron Judge and Mike Trout. “I’ve got to do a couple more pushups,” Alonso cracked, drawing laughs. Alonso has 17 RBIs, a Mets record through 12 big league games. His 12 extra-base hits are the most by any major league player since 1900 in the first 12 games of a career. The big first baseman is batting .378 with six doubles and a 1.362 OPS. His sixth homer put New York up 6-2. 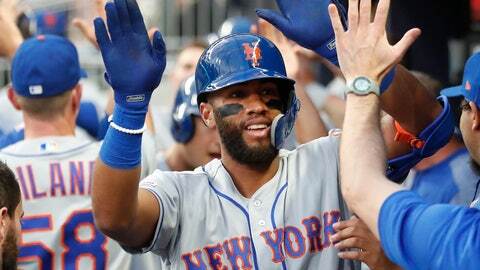 Rosario hit an early three-run drive and New York ended Atlanta’s three-game winning streak in the opener of a four-game series — the first meeting this season between the NL East rivals. Matz (1-0) had gone eight straight starts without a decision, a streak that began last Sept. 1. He allowed two runs and four hits with one walk and eight strikeouts, crediting his changeup for much of the success. Rosario’s homer gave the Mets a 3-1 lead in the second. New York had three other hits against starter Kevin Gausman — Juan Lagares‘ single in the fifth, Wilson Ramos‘ single in the sixth and Jeff McNeil’s single that advanced Ramos to third and chased Gausman. Wes Parsons gave up Rosario’s run-scoring single to make it 4-2. Gausman (1-1) allowed four runs, three walks and struck out five in 5 2/3 innings. He walked his first two batters in the second before facing Rosario. Atlanta led 1-0 in the first on Acuña’s RBI triple. Johan Camargo’s first homer cut the lead to 3-2 in the second. Mets: Manager Mickey Callaway said 3B Todd Frazier, on the injured list with a left oblique strain, is close to returning. Frazier played five innings at third base and four at first in a rehab appearance with Class A St. Lucie. He went 1 for 3 and is hitting .217 with no homers and four RBIs in six games, a span of 23 at-bats. Frazier played a few innings at shortstop on Tuesday. Braves: Manager Brian Snitker said RHP Mike Foltynewicz needs to make another rehab start to get his pitch count up to 90 before coming off the injured list. Foltynewicz, an All-Star last season, will make his third rehab appearance with Triple-A Gwinnett on Monday. He is sidelined with a right elbow bone spur. A few hours before the first pitch, Ozzie Albies and the Braves agreed to a $35 million, seven-year contract, a deal that includes team options for 2026 and ’27. Albies struck out against Robert Gsellman with the bases loaded in the seventh and went 0 for 5. The second baseman made a dazzling play on defense in the fourth, leaping to snag Ramos’ liner. Acuña homered in his third consecutive game and has multiple hits in three straight, too. He’s batting .636 with five runs and five RBIs during that stretch. Snitker was ejected in the bottom of the eighth by plate umpire Dan Bellino for arguing balls and strikes. Mets: RHP Zack Wheeler (0-1) brings a 10.24 ERA into his third start after walking a career-high seven in his last outing. In 10 career starts against his hometown Braves, Wheeler is 5-3 with a 3.21 ERA. Braves: RHP Kyle Wright (0-1) improved in his last outing, a no-decision in which he allowed five hits and two runs in six innings against Miami. He will face the Mets for the second time in his career.